El Palacio Andaluz is a flamenco tablao in Seville, whose activity attracts thousands of people from different corners of the world each year, who usually choose us to enjoy a live flamenco show when they visit the Seville capital. 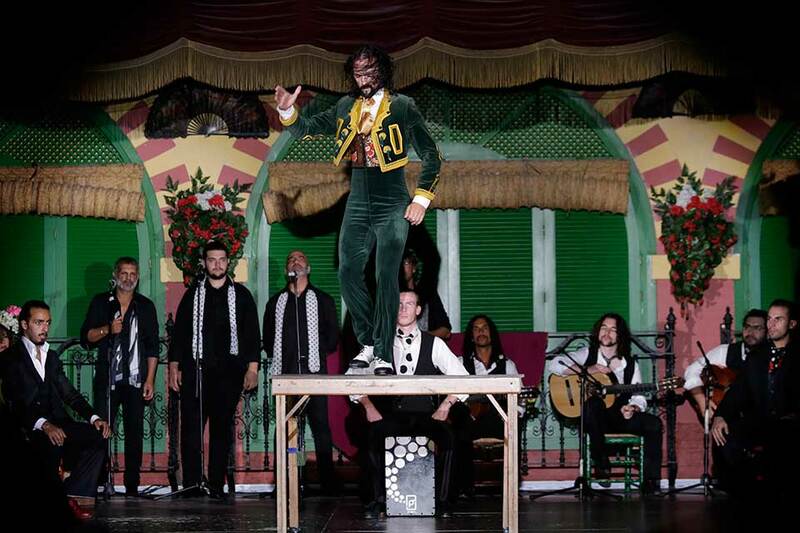 Located in an emblematic Sevillian building, in the well-known neighborhood of La Macarena, El Palacio Andaluz keeps the essence of the old coffee theaters, with several floors and spaces decorated with Andalusian style and stamp, and its distribution allows attendees to enjoy the most and with detail of the shows that are celebrated daily here. 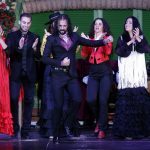 The history of El Palacio Andaluz is linked to flamenco, a cultural activity that awakens the interest of visitors and the media both inside and outside of Spain. Proof of this is the number of times that our flamenco tablao in Seville has been required by national and international magazines and television channels to disseminate our work. A few months ago we echoed a very special visit, the 10 Chinese influencers, actors, singers, influencers of education, fashion, tourism, entertainment and gastronomy that added more than30 million followers in different social networks. These ‘famous’ visitors could enjoy our live flamenco show, an experience they immortalized in videos and photographs and, of course, they shared with their ‘followers’ in their crowded virtual profiles. 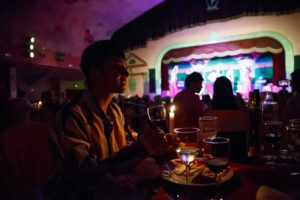 In this way, the staging and interpretation of our artists traveled virtually from our flamenco tablao to millions of mobile screens and computers in China. The flamenco show, to which every night our cast of artists gives life, has been chosen by Televisión Española (TVE) for the promotion and diffusion of flamenco internationally, thanks to the visual quality, its artistic value and for being model and example of the most deeply rooted Spanish culture. But this channel has not been the only one that has been fixed in our show, because the program ‘Danças do Mundo’, of Radio Televisión de Protugal (RTP 1), also broadcast images of our show in reference to flamenco. Trafalgar Travel, group Tracoin, the leading travel company in the world, also took a look at our Seville flamenco tablao for the promotion of this art worldwide. 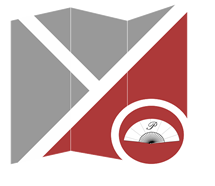 For this, he recorded a report entitled ‘Immerse yourself in the culture’ in which he gave details of our activity. On this occasion, much of the role was taken by Emilio Ramírez, “El Duende”, artistic director of the flamenco show, who explained how he feels and what impresses him to see the audience get excited when he attends El Palacio Andaluz to see flamenco performance in direct. In addition to television, the work of El Palacio Andaluz has also echoed Korean online media such as Medical Times. 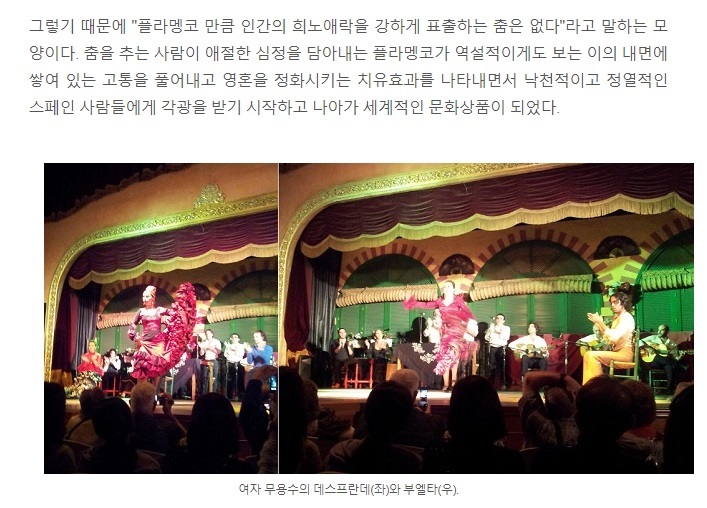 In this space, we find the article that a visitor wrote in which he explains in detail how he lived his encounter with flamenco in our tablao, a chronicle that can be accessed in this link, although we note that it is in Korean, as we see in the following image, which is an excerpt from the mentioned article. The ELLE Magazine also chose El Palacio Andaluz to make part of the photographic report that was part of the number entitled “Rumbo al Sur“. Recall that ELLE is a world magazine that focuses on fashion, beauty, trends, entertainment and celebrities. To carry out this work, the ELLE team was in our facilities where he did some photo sessions and also had the image of Emilio Ramírez ‘El Duende’, recognized as one of the best dancers in Spain, to complete his report, just like we can see in the following image. Undoubtedly, for the El Palacio Andaluz team it is a real pride to be able to contribute to the cultural promotion of flamenco with the work we develop every day in our flamenco shows, a task that is disseminated by different national and international media. Hence, we are a tablao of Seville with doors open to the world.